I'm not gonna lie. My initial reaction to SKET Dance was that i hated it. I had watched it when the first episode was released way back when and i was like "Ehh, this isn't bad, but it's far far far from good, it's pretty boring, i can't see myself watching it" and then the next episode came out the following week. Since i had only to watch one episode per week and only had to spend 20 minutes of my time on top of that i decided to keep up with it. Weeks passed and i still wasn't impressed, it just struck me as a super average generic anime series. However, by around episode 7 that changed. At around episode 7 i started to actually like and enjoy the series. It was still far from a favorite but it was actually worth the watch every week now. As the episode count built up i started to enjoy the series more and more and by episode 26 i had utterly and completely fallen in love with the series. I think every person who tries to watch the show and say they don't like it should AT LEAST give it 26 episodes and if they still don't like it than drop it. Characters: Now, on to the real review. The characters are solid, SKET Dance has one of the most vivid characters in an anime series, especially an comedy anime series. The characters grow on you no doubt and soon they become characters you really love and enjoy. A fair amount of the supporting cast always returns in some point or another so the show does a good job in introducing characters and not just forgetting about them like alot of shows tend to do. Storyline: It's a comedy series so theirs no deep storyline. If a linear storyline is what you're looking for you shouldn't even be looking for a straight up comedy show to watch. The show does have many creative and fun one-shot stories however. When you throw the special "backstory" episodes in too the equation then you have real story! The backstories on the main characters are some of the most well written, realistic backstories that a character can have and it makes the characters just that more 3Dimensional. The stories that the show does do are solid and it has plenty of variety. Silly, Serious, Light-hearted, touching. You name it. Music: The music really fits in with the scenes the series does. The music isn't really anything THAT memorable (unless you count the Opening and Ending music which is always a treat) but for what it's worth, the music always blends almost seemingly into the scenes in which they are portrayed. I've never seen an complaint about the music not fitting in where it was used. Animation: Th animation is top notch and it fits perfectly into the series. The characters look practically exactly how they looked in their manga forms and the overall flow of the episodes move along so smoothly. I've got to hand it to Tatsunoko Pro. They animated this beautifully. Easily my favorite anime now. I went in to Sket dance, not really knowing what to expect, the "preview" episode did'nt fully prepare me for how much this show would make me laugh, cry, blow my mind, and get me so involved in the characters. This is a comedy anime, however it has some episodes in it that get you right in the "feels" really tugging at your heartstrings from time to time, or blow you away with some of the truely wonderful back-stories of the main characters. The series never misses a beat, always leaving you feeling satisfied at the end of every episode. For a Comedy anime, the length they go to to keep the series continuity going is wonderful, bringing back old characters from earlier episodes, having them make appearances in each and every of sket-dances many wonderful opening credits, makes it feel like you can care about the characters, no matter how big or small. This anime has made me laugh, cry, hope, faith, and much more. A wonderful anime, so I want to say this to the creators: thank you so incredibly much for making this wonderful anime. I love it so incredibly much! It was a funny yet serious (kinda) at the end of the first episode with the paint. I loved it and the manga was just as good. If your a fan of comedy,mystery,and action then this is a must see anime. 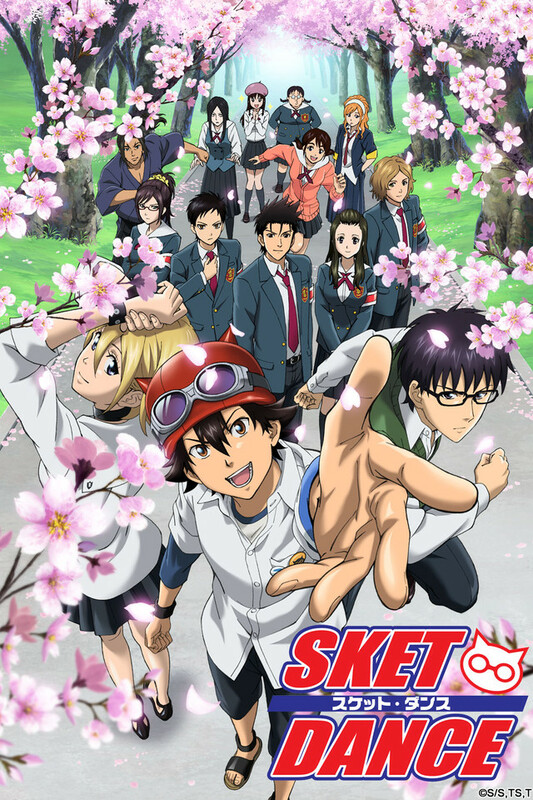 Anybody that's looking for a good comedic anime, SKET DANCE is the way to go.You will never regret watching this anime. You will laugh, and cry all in one episode. This show is very addicting and lovable. This show will leave an everlasting impression on your heart!!!!!!!!!!! A MUST WATCH ANIME AND WE WANT SKET DANCE BACK!!!!!!!!!! My first impression was when I saw the title...I really hate it because I thought it was about dancing BUT I WAS 100% WRONG......I WAS WRONG. This anime was really amazing and great and I started to like the SKET DANCE. Please tell the Mangaka-san and Director-san....they need to continue this anime and the manga. I willing to spend all my money on it. I saw this show for a while but I put off watching it for a couple weeks. When I finally decided it was time to watch it, I wished that I had started sooner. This is, and will remain, one of my favorite shows of all time. It has made me laugh more than any show I have ever seen, while at the same time there are moments of the show that are really touching. This is a show that really redefines the school setting and makes it its own. With a great cast of characters, an episodic plot style with a few overarching plot lines, great music throughout the show, and some of the best character interactions and situations. I recommend this show to everyone I know, except for those who don't like comedies (not very many). If you like good laughs then you will like this show. I Would recommend this show to anyone that enjoys watching anime. Personally SKET Dance is my #1 show to watch if I wanna laugh. SKET Dance had me interested after the first few episodes, and kept me hooked which isn't something i can say about too many shows. I think anyone reading this review should watch a few episodes and learn to love this anime just as I did. This anime has it all. Suspense,drama,comedy, mystery, romance, and so much more. It really makes you laugh, like they say, "laughter is the best medicine" The characters are really well made,they synchronize together.